Board meetings— a necessary component of a well-run organization or company. These meetings are often where innovative ideas come to fruition. It’s also where some of the most important discussions regarding your organization and its governance take place. Unfortunately, these meetings also come with a long list of mundane tasks that can quickly lead members to burn-out, and distract from the most important thing— your mission. The Board Chair emails the other members a copy of the previous meeting’s minutes along with options for the next meeting date. After a few days, many board members have replied to the email, but some still haven’t. Relying on email to schedule a meeting has its own unique challenges as well. An emailed meeting invitation can easily get lost in inboxes or, for various reasons, could fail to be delivered at all. At this point, the Chair might need to send separate emails to members to inquire about their availability. Once the majority of members have responded, a date is set. The Board Chair reviews the previous minutes, and builds an agenda based off of it. Once the agenda is finalized, the Chair will need to locate, compile, and make copies of all the supporting documents that will accompany the agenda. An email of the meeting packet is sent out to members, which includes: previous minutes, current agenda, supporting documents, and other items that need to be discussed. When sending important meeting documents to other members, security is often a concern for the organization. Another option the Board Chair may consider is a courier service, but that can often include additional printings and more expenses for the organization. Packets are printed out for all of the board members that will be in attendance. The Board Chair may also be answering members’ emails or phone calls about the meeting. The meeting room is set up, snacks are prepared, and meeting packets or binders are printed, divided, and ready for the members. During the meeting, the Secretary or another board member will have to write down most of the discussions for recording later in the meeting minutes. If you’re a board chair or committee leader, you’d agree that completing all of these tasks each month or quarter can really distract from things that help further your organization’s mission— like meeting potential new members, attending community events, leadership retreats, or planning new, innovative ways to keep your board mission-focused. Agenda Builder: The agenda building feature makes it easy to quickly create a meeting agenda. Admins can save an Agenda Template, so that each month it can quickly be filled in. When it comes to agendas, you’ll no longer have to worry about formatting, numbering agenda items, or messing with headings. Maintaining an online meeting agenda within the board portal allows users to view correlating documents at any time (including during the meeting) and add notes to agenda items. Minutes Builder: The workflow capabilities built into BoardPaq allow admins to capture and revise minutes easily. The admin can then initiate a review process including all members or selected attendees. Attendees will receive a notification within BoardPaq that there are Minutes to be reviewed. The reviewed minutes can then be forwarded to the next meeting as a document that can be formally approved and eSigned. This can all be done within BoardPaq’s secure portal, ensuring confidentiality for your organization! Document Viewing: Members can always go back to old meetings and review previous minutes, agendas, and supporting documents. If you’re able to access a meeting, you’re able to access the documents associated with it. Meeting Calendar: This feature allows easy access to upcoming meetings as well as past meeting materials, and it automatically displays all the meetings for the current month.The RSVP feature allows members to inform the board administrators of their availability and provide additional notes prior to meetings. 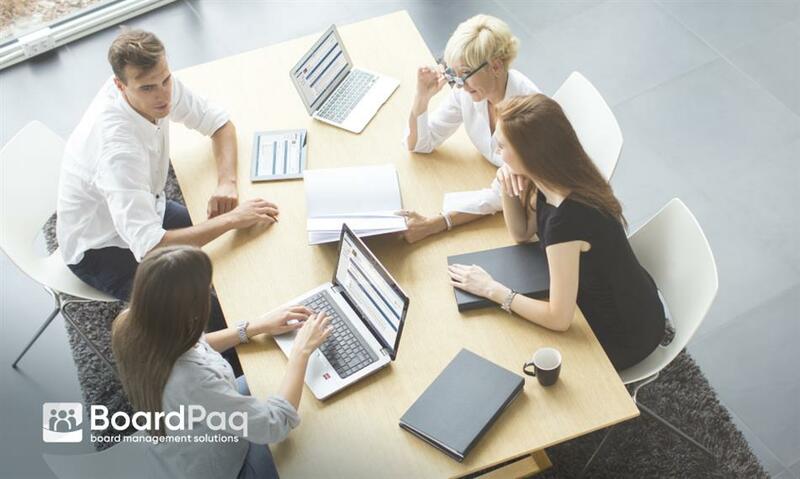 As the leading board management vendor, BoardPaq hopes to see engaged board and committee leaders who aren’t weighed down with unnecessary tasks. Utilizing time-saving features like the agenda and minutes builder, document viewing, and meeting calendar allows space to plan for more important things— like the discussions and ideas that could greatly impact your organization and industry. Interested in seeing how BoardPaq can eliminate the mundane tasks that come with preparing for a board meeting?